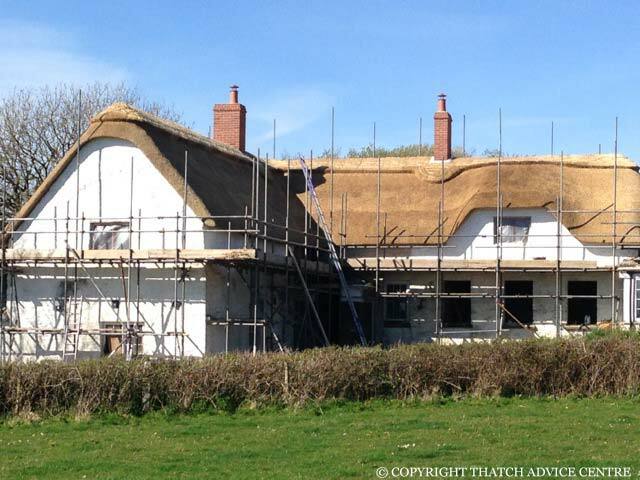 The lifespan of a thatched roof and therefore its maintenance requirement is due to several factors. Because of the natural degradation of the material over time, it will eventually reach the stage where it requires completely rethatching. Repairs may extend the life of certain areas but it will reach a situation where there is no life left in the surrounding material and it is false economy. Keep an eye on your roof and any changes especially before and after the Winter period. Always get more than one quote for work which requires doing so that you avoid the ‘rogue thatchers’ touting for work. Unfortunately they exist in all trades and memberships and smart websites are no guarantees. Establish early on what condition the thatch is in, then any necessary work can be quoted for and planned into a schedule of maintenance. If a listed property requires a total rethatch, the local council listed building department/conservation officer should be consulted. The owner and thatcher should both seek the relevant advice from the authorities if they are uncertain as to the requirements. Listed Buildings should always be maintained on a like for like basis. 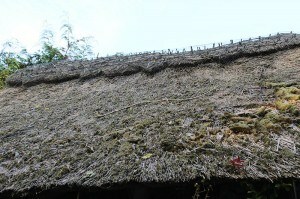 Generally the ridge of the thatch will require replacing every 10 – 15 years. The coatwork will vary depending on the material used and its associated lifespan. Allow it to dry well, remove trees and plants which may hinder the sun and wind drying it or rain dispersing. If it is damp it will also increase the likelihood of moss and algae growth which in turn keeps the roof wet. Do not allow other trades to damage the roof either with ladders or by walking on the thatch. Any divot created has potential to accelerate the wear of the thatch and on the ridge damage to fixings can be especially detrimental to the roof life. Do not assume that because the roof looks neat (with a good- conditioned ridge pattern) that it is prime condition. Often sellers get a new ridge done on an old roof which is beyond its life just to sell it. 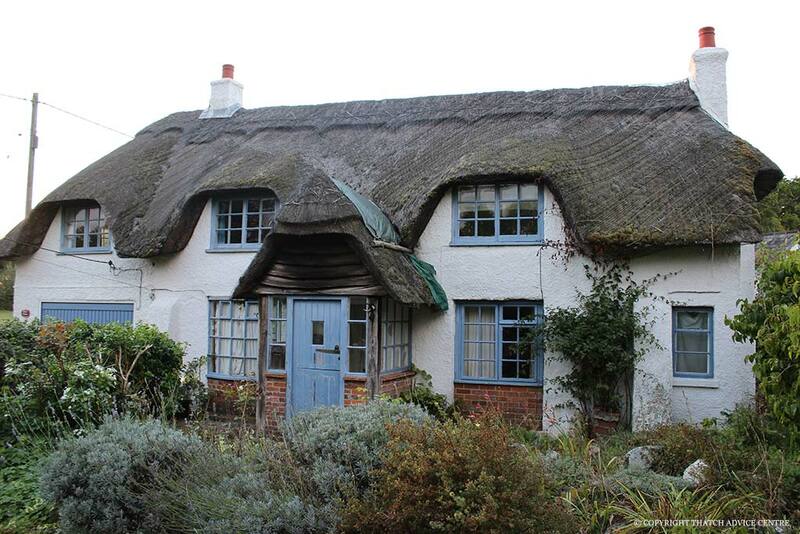 We can advise if you are looking to buy a thatched property and are uncertain. On the ridge, the wire netting may be left raised where the thatch has degraded and the fixings (spars) may well be showing sticking out. The ridge may well be perfectly serviceable even if the fixings are showing and it is looking a bit untidy. Lines across the main roof coatwork and dips also indicate wear. Moss and lichens often are associated with well decayed roofs and sometimes the roof has reached a stage in its life where moss is best left as to remove it will do more damage than good. If you look at the eave and see a triangle of dark material it may indicate water ingressing and wear of the roof. Lead and cement flashings coming away from chimneys and gaps where they meet the thatch should be checked and cement flashings which are cracked or broken may need looking at. A thickly thatched roof is not the best roof, it is down to the pitch of the roof. These are just indicative signs. If you send us a picture we can give you a better idea or call out thatchers for their opinion. This generally involves removal of any wire netting from the ridge, removing some or all of the old ridge to a firm base and then re applying the ridge. This is the stage at which a roof is often dressed up and brushed down (except for Longstraw). Dressing up is done as the gradual deterioration of the thatch causes the thatch to loosen slightly from its fixings. In dressing up, the thatch is knocked evenly and securely back up into their fixings. 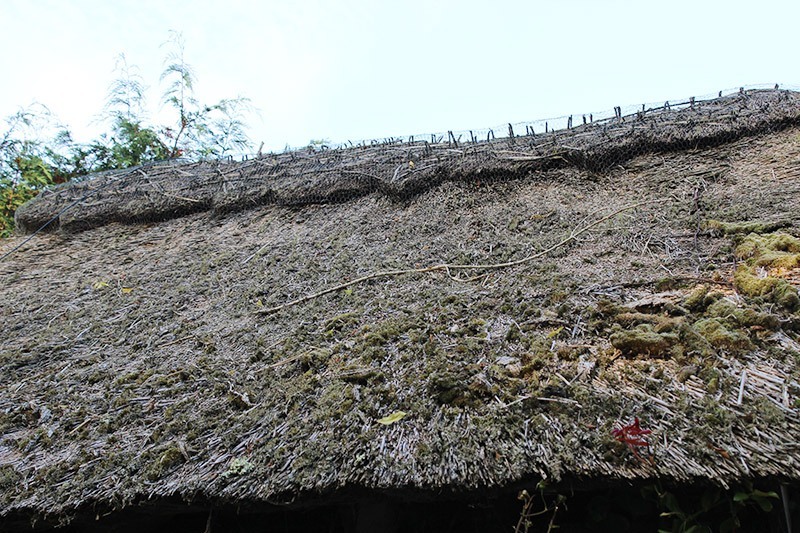 Brushing down is done after dressing up where the surface of the thatch may be brushed down to remove loose material and moss, which can retain moisture and gradually damage the body of the thatch. From patching to re-ridging and total rethatch along with repairing vermin bird and storm damage the thatcher will help keep your roof sound. Thatch which is well-laid and maintained should not normally be damaged by wind or develop holes. If isolated holes do appear (eg bird damage) they can be repaired provided they are not associated with underlying problems such as the roof having reached the end of its life. A patch is best done in the same material as the coatwork and is usually held in place with spars or screws. The surrounding area of old thatch will be prone to more wear. Please note the comment above on Listed Buildings and total rethatch. A total rethatch can involve stripping a roof to a firm foundation or stripping the roof to timbers. If stripping to timbers this option is the one where building regulations should be addressed. 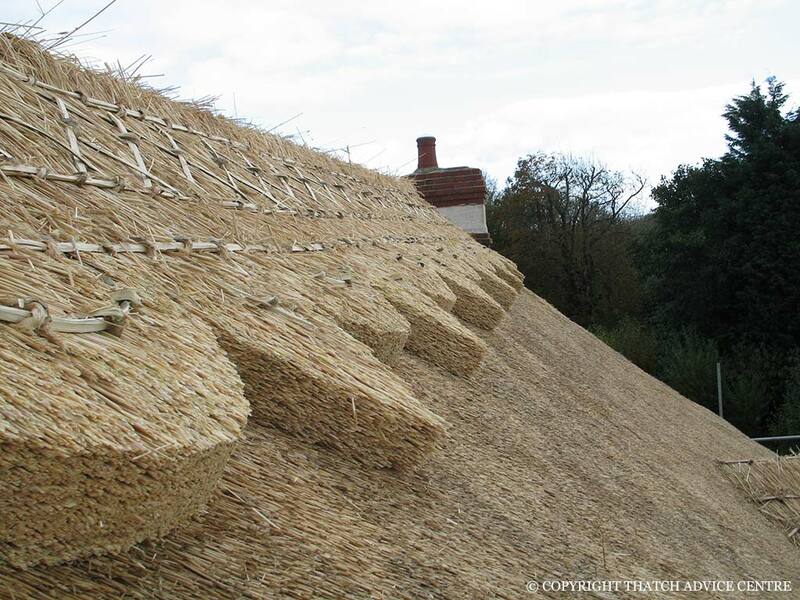 Fire barriers (minimum 30 minutes on B4 building regulation) are applied over the rafters and under the thatch. There are solid board and also flexible breathable options to consider. Models with LABC approval should not usually require discussion in meeting the regulations. Be aware that there are products on the market which do not meet the criteria and wording on fire proofing can be confusing. Fire barrier, fire protection and fire resistance are very different in the meaning and performance. Make sure you understand what you need and what you are being offered. Whether stripped to a firm foundation or to timbers a rethatch of the coatwork (like for like if listed building) will also involve a new ridge. The whole roof is often wired in the case of Combed Wheat and Longstraw although it appears to be a regional preference. This is due primarily to deterring vermin problems. Water Reed roofs tend to just have the ridge wired in . The depth of the fixings is paramount to the lifespan of the roof and this is down to the skill of the individual thatcher. There should be at least 4” (100mm) of thatch over the fixings on a new thatch. Cement flashing are generally replaced as necessary or on re-ridging. Lead flashing are more expensive and last longer and may last for several ridges. Code 4 lead is stipulated. A well maintained roof can be further protected using fire retardant spray eg Magma Firestop®.